One problem is the increased pressure on the land which arises from the increasing size of most national herds. 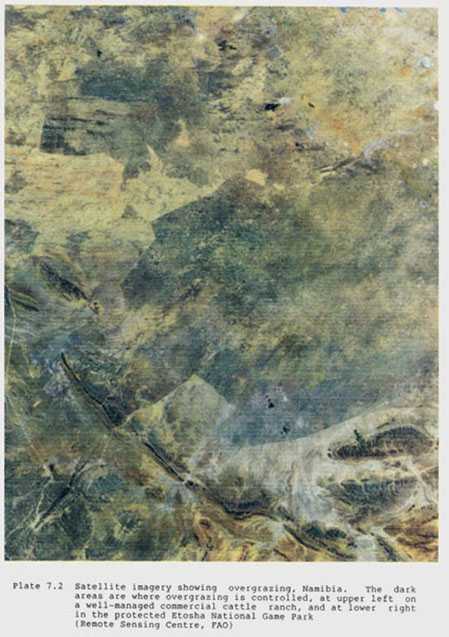 Two examples are shown in Figure 7.1, from the Mambilla Plateau on the border of Nigeria with Cameroon and from Swaziland. In Swaziland, the average size of the family herd has not increased, and the increase in the national herd is propor- tional to the increase in population (Fowler 1981). In the Nigeria example, the increase is the result of increased settlement by the Falani who are abandoning their traditional pattern of seasonal migration with their herds. In both cases there are grounds for believing that the eco- system is being irreversibly degraded. Both these situations are repeated throughout semi-arid Africa. 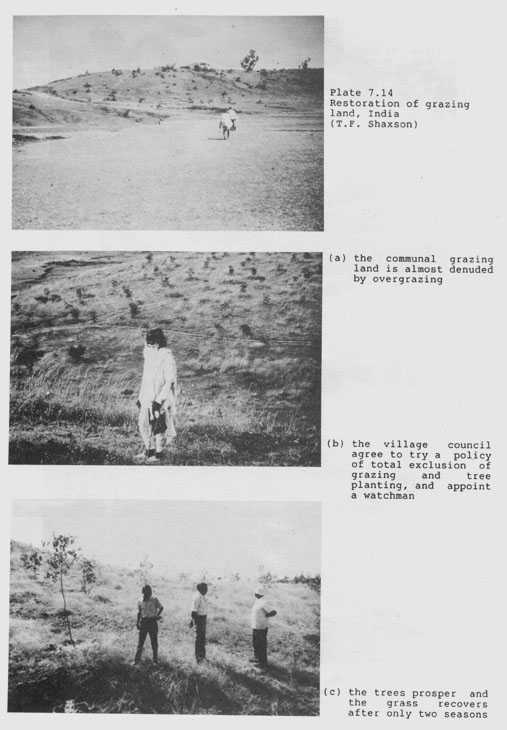 The difficulties of destocking are analysed in relation to a tribe in Tanzania by Stocking (1985), who sums up the position by saying, "The message is clear: erosion of grazing land cannot be tackled by destocking. Overstocking is a symptom of deeper problems, and there is little point in merely treating the symptoms." The decreasing mobility of nomadic or semi-nomadic pastoralists arises from a number of reasons; national policies may reduce the flow across national borders, fencing may interfere with traditional movements, civil disturbance may deter the pastoralists from following traditional routes, or it may be the result of a government policy of settling the nomads by land allocation. Discussing this policy in Botswana, M.L. and M.J. Odell (1980) review the long series of livestock development projects and, referring to one of the most recent, say "behind its formulation lay the conviction that only by granting individuals and groups exclusive rights to the use of defined areas of grazing land, would citizens have any incentive to control their stock numbers." These programmes also hoped to achieve better management of the stock and range, and greater productivity, by the provision of additional water resources. In the case of surface water, the government programme sponsors the construction of large numbers of small dams, to be managed by groups of local farmers. The amount of water stored and the amount of herbage are both dependent on the rainfall, and when the water dries up the livestock are moved on to pastures new. However, the traditional concentrations of people and cattle are at what are known as 'cattle posts', sited because of the presence of streams, wells, or other surface water. The traditional system was to move the stock away from the villages during the rainy season so that the grazing there is preserved for when they return during the dry season (Fortmann and Roe 1981). In some cases, the source of supply has been replaced by boreholes which draw water from the underlying Kalahari sands. This has improved the availability of water close to the cattle posts, and reduced the seasonal movement to traditional grazing areas at some distance, with the result that there is severe local overgrazing and degradation close to the population centres. · a framework for investment in water facilities, livestock extension services, training, and credit. By and large, the programme was considered successful. 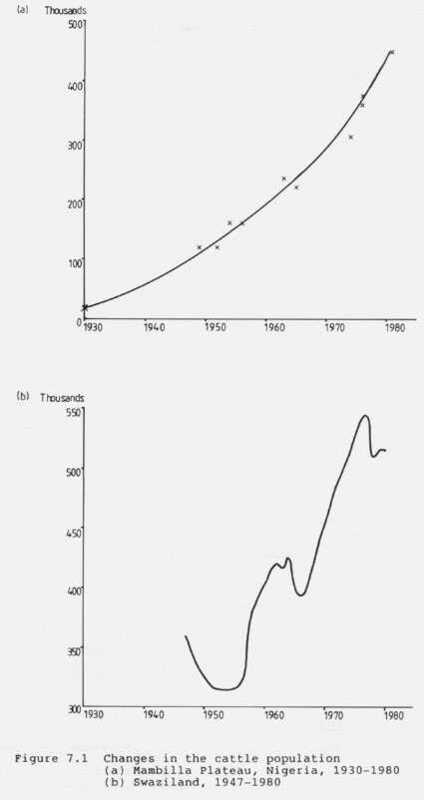 Between 1977 and 1983 the herd composition improved, mortality declined, and calving rate increased. Both offtake and herd size increased. Between 1980 and 1982 the average income per family from livestock increased 48 percent owing to an increased offtake combined with better prices. Water management is usually the key to increasing the productivity of semi-arid grazing land. There are many other aspects of good management, the use of an appropriate stocking rate, rotational grazing with rest periods, the controlled use of fire, and improving the herbage composition, but water management is usually the most important. In field trials in western Colorado, grazing control alone reduced run-off by 30 percent and sediment yield by 35 percent (Hadley 1977). Changing the vegetation from woody shrubs to grass in Arizona decreased the amount of run-off and increased the carrying capacity, and the authors comment "considering the large amount of semi-arid range land areas of the world, of which the pre-treatment area was typical, such range land conversion can have a tremendous impact on the agricultural and economic output." (Simanton et al. 1977). 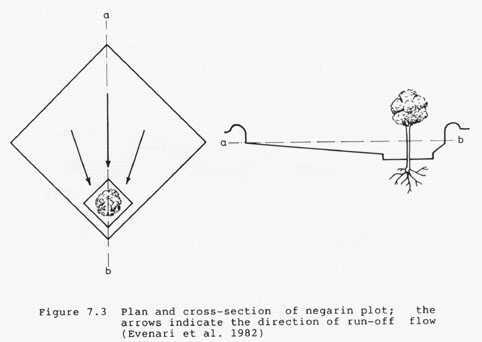 In a factorial field experiment in Nebraska with a mean annual rainfall of 500 mm, the run-off saved by contour furrowing was up to 30 percent of the rainfall (Dragoun and Kuhlman 1968). 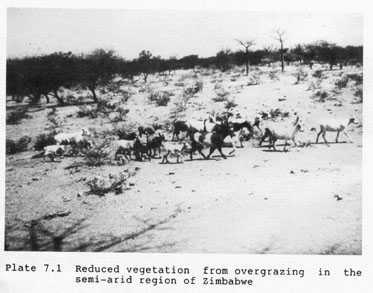 Another example of a close linkage between grazing management and water supplies, similar to the Botswana example in the previous section, comes from Butana region in the Sudan, with a mean annual rainfall of 200 mm. Present day nomadic herders continue a practice thought to have started more than 2000 years ago. Wells are dug to store water during the summer thunder storms. But when the rains start, the herds are moved out from the Atbara river onto the grasslands of the Butana, returning later to use the stored water and the nearby grazing (Hays 1981). Another variation of using water supplies to manage the grazing comes from Arizona with a mean annual rainfall of 150 mm. A 1500 ha range had three permanent water supplies and two seasonal supplies. Instead of controlling the grazing at high cost by fencing, it was managed by fencing off each water supply, and opening them one at a time. The cattle were encouraged to use the open supply by placing salt blocks there. During the first season the cattle had to be driven away from the closed water but within a year had learned to move to wherever the water was open (Martin and Ward 1970). A number of methods are used to reduce surface run-off by manipulating the soil surface so as to slow down the run-off or to increase surface depression storage. Since these usually involve catching and holding water temporarily in furrows or depressions, this can be used to assist germination when reseeding to improve the herbage species composition, or to introduce new species. Water spreading by diverting flood flows was discussed in Section 5.3.2. Simple methods of spreading the water may give a distribution which is not sufficiently uniform for cropping, but can improve the grass production at low cost, even if the effect is patchy. This is an old established practice in the semi-arid western states of the USA as reported by Valentine (1971). An example from Australia is shown in Plate 7.3. The productivity of grass can be impaired by the deposition of sediment from floods carrying a high silt load, so sediment traps are sometimes included in the distribution system. Large spreading banks may be a nuisance if the land is in a rotation with arable crops. In this case a smaller version can be used, as shown in Plate 7.4 from Western Australia. Here wheat alternates with a self-sown pasture of grass and sub-clover. The small pasture furrows are run on a true contour with all the excavated soil spread thinly on the uphill side. The furrows catch and spread small run-offs, and if the run-off exceeds the storage it spills over the downhill edge without causing an erosion problem. Machines have been developed in the USA to make small furrows and apply fertilizer, grass seed, and legume seed in a single pass (Erickson and Currie 1982). 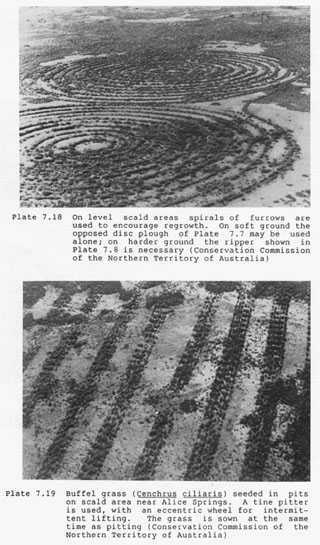 In flat lands in Australia, small pasture furrows have been used in rectangular pattern to encourage ponding and infiltration on degraded range land (Cunningham 1974). 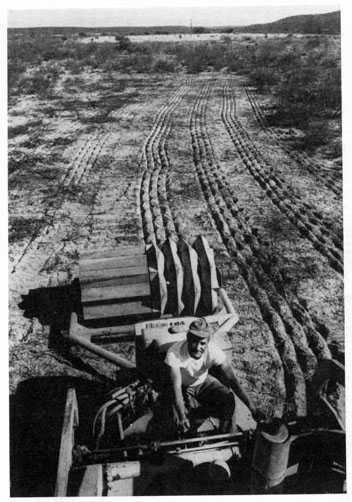 Contour furrows have been shown to be effective in the USA by Dragoun and Kuhlman (1968) and by Neff and Wright (1981). The effect is sufficient to justify expensive operations for commercial ranching, but they are not appropriate for nomadic or semi-nomadic graziers at subsistence level. It may be possible to substitute inputs of labour for inputs of money or machines, and an example is the semi-circular hoops discussed in Section 5.2.4. In Niger, small basins (cuvettes) are formed by digging small furrows (20 cm deep), with hand-hoes, in a square grid at 10 m intervals. 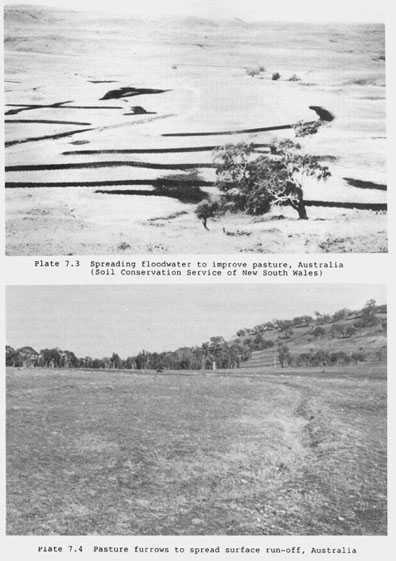 Dung is spread in the basins, and grass seed scattered to give improved grass growth (Gallacher 1974). Another method requiring only labour and local materials is the building of low stone banks, discussed in Section 7.2.2 and shown in Plates 7.5 and 7.6 as 'diguettes'. These may be used for growing fodder or food crops, with the choice depending on the rainfall and the wishes of the local population. In Burkina Faso and in Kenya, projects have started out with the object of improving food for livestock, but have later changed the emphasis towards food production. 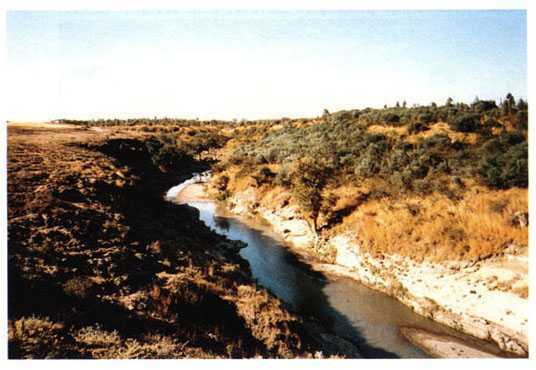 Another example of changing the objective occurred in the Negev desert where microcatchments were used to direct all the run-off from a basin to the lowest point where a fruit tree could be grown. The nomadic Bedouin felt a greater need for pasture shrubs than fruit. Microcatchments are described and illustrated in Section 7.2. Considering tools for improving the surface storage, the principle of holding rainfall in small furrows or depressions, discussed in Section 5.2.2, can also be applied to range land, and several machines have been developed for the purpose. 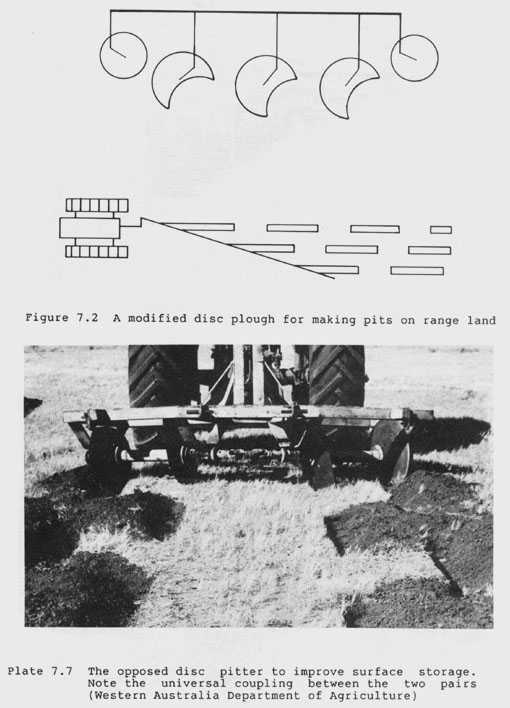 One is a modified disc plough shown in Figure 7.2, where some of the plough discs are removed and those left have a piece cut out of the disc, so that the effect is to produce shallow plough furrows in short sections. 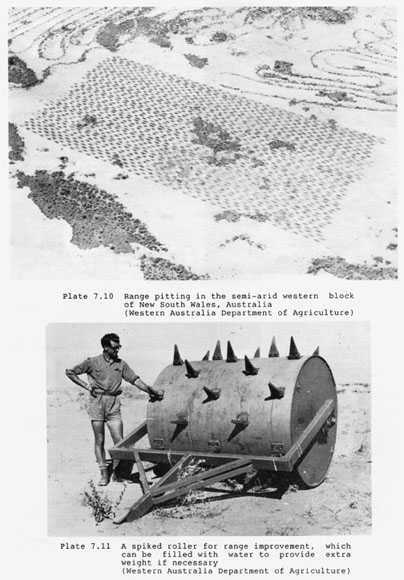 Using this method in Arizona was shown to be effective in both reducing surface run-off and increasing the density of the grass cover (Tromble 1976). 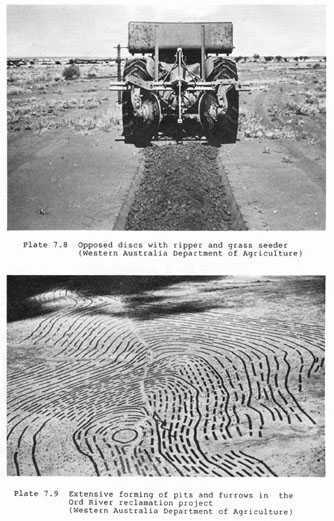 In Australia two implements to achieve a similar effect are the opposed disc pitter (Plate 7.7) and the ripper plus opposed discs (Plate 7.8). The result is shown in Plate 7.9 in the north west of Western Australia, and Plate 7.10 in western New South Wales. Another machine for creating pockets of high infiltration and storage is the tine pitter, which consists of heavy duty tines mounted on a rotating shaft or drum, and a variation, the spiked roller, is shown in Plate 7.11. A machine which improves surface storage by creating a corrugated effect is the land imprinter, developed in Arizona (Dixon 1983), and also manufactured in Australia (Plate 7.12). Where grazing land has been degraded by overgrazing, the capacity for it to recover when rested is sometimes quite remarkable. Plate 7.13 shows an example from Ethiopia, where the total exclusion of all livestock on one side of the river gave a rapid recovery. Another example comes from India, shown in three photographs in Plate 7.14. Total exclusion was enforced by a watchman, and trees for fodder and fuel were planted in a programme operated by the local community. Again, there was a rapid recovery after only a few seasons. Where the degradation is exaggerated by drought or unreliable rain- fall, more intensive reclamation using machinery may be necessary. Some of the techniques are demonstrated in Plates 7.7 to 7.12, and 7.15 and 7.16. Two successful projects are reported from Australia; one in Central Australia reported by Keetch (1981), and the other in Northern Territories reported by Fitzgerald (1976). In semi-arid areas we do not find woodland, bush, grazing land, and arable land occurring as separate forms of land use. The landscape is always a mixture of some or all of these, and trees or shrubs will always be a part of the ecosystem. They supply many needs: fuel, browse, construction, food crops and cash crops, and usually a combination of more than one of these. Depletion of the natural stock of trees and shrubs is one of the indicators of excessive pressure on the land leading to an increasing rate of degradation. The pattern of progressive degradation is described by Brown (1985) based on the model of Newcombe after studies in Ethiopia. In the first stage, natural forest retreats before the plough, but wood supplies are adequate and the gradual decline in crop land fertility is not noticeable. As populations grow, markets appear for wood which is cut and sold by peasant families who turn to crop residues and animal dung for their own fuel. Depletion of the forest accelerates; so does the decline of crop land fertility, and the rate of soil erosion. As the nearby trees disappear, dung and crop residues are increasingly traded in markets where formerly only wood was sold. Eventually cow dung becomes the main fuel source in villages and thus the main cash crop from nearby farms. Rural families use crop residues for cooking, and as forage for their livestock which the grazing land can no longer support. Crop failure increases on the eroded and depleted soil, and droughts which could formerly have been tolerated, now become a disaster. In the final stage, a sequence of poor rainfall seasons causes the collapse of the system. Families cannot feed themselves or their livestock, and there is a massive exodus. As Newcombe says "this transition from the first to the final stage is in process right across Ethiopia and has reached the terminal phase in parts of Tigre and Eritrea." Similar patterns are unfolding in many other semi-arid areas; in the rest of semi-arid eastern and southern Africa, in the Sahel, in India, in north-east Brazil, and so on. In many countries the increasing scarcity of fuelwood is becoming as critical as the scarcity of food (Eckholm 1976, Chapter 6). In India it has been estimated by the National Committee on Agriculture that the present day fuelwood need of India is 250 million m3, plus about 60 to 80 million tons of dry cow dung, and the deficit is expected to reach 100 million m3 by 1990. In this context, the need to maintain or expand the production of trees and shrubs through soil and water conservation methods and programmes is clearly a major challenge in the semi-arid regions. The usual techniques for afforestation are seldom appropriate in semi-arid areas. The unreliability of the rainfall makes it difficult to get the trees or shrubs through the initial stages of growth, even if the annual rainfall is sufficient to maintain mature plants of the same species. The soils are frequently poor and shallow, with low moisture storage capacity. Even if these physical problems can be overcome there remains the difficulty of protecting the young plants. In pastoral economies there is little use of fencing, except occasionally to protect food crops, and the usual pattern is either completely free grazing or light control with rather casual herding. Where total exclusion of stock is possible, like the example described in Section 7.1.3, the protection of the grass can be extended to trees and shrubs. Several methods have been developed to increase the amount of water vailable for tree production using the rainfall multiplier approach escribed in Chapter 5. 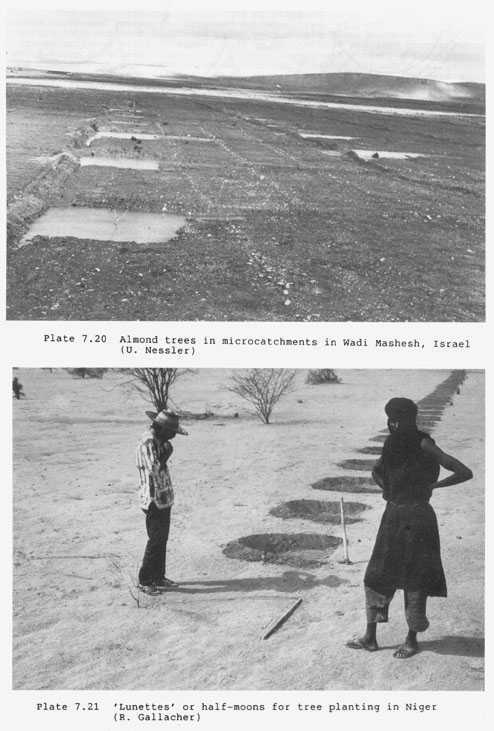 Microcatchments, or 'negarin', were developed as art of the Israeli studies of run-off farming in the Negev desert (Shanan and Tadmor 1979). A typical design is to use a basin of 250 m2 as the catchment area and surrounded by a low earth bank. At the lowest point within the basin, a deeper basin is excavated about 3.5 m x 3.5 m, in which one tree seedling is planted (see Figure 7.3). The system has been successfully used for the establishment of almond trees and fruit trees as shown in Plate 7.20. In Kenya, in an area of rainfall of 300-600 mm, a slightly different method was used. Planting holes were dug 600 x 600 mm and 300 mm deep, with a collecting drain to form two arms of a V leading run-off into the planting hole. In heavy rain run-off surplus to the capacity of the hole spills over at the end of the collecting drains. The recommended length of the collecting drains is 3-5 m and the spacing is 5 m x 5 m or 400 trees per ha (Barrow 1983). Other variations are small half-moons (lunettes) as in Plate 7.21, and lines of small semi-circles or Vs as in Figure 7.4. 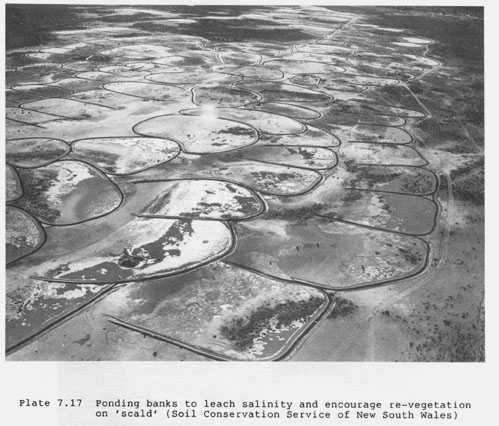 In very low rainfall areas, the yield of micro- catchments can be enhanced by treating the surface to increase the run-off and this was demonstrated by Rawitz and Hillel (1975), who found that it was necessary to treat the surface of deep loess sandy loam by compacting and spraying with diluted fuel oil. With a catchment ratio of 3:1 and rainfall of 200-250 mm this gave an effective rainfall at the planting site of 600 mm which was satisfactory for almond orchards. 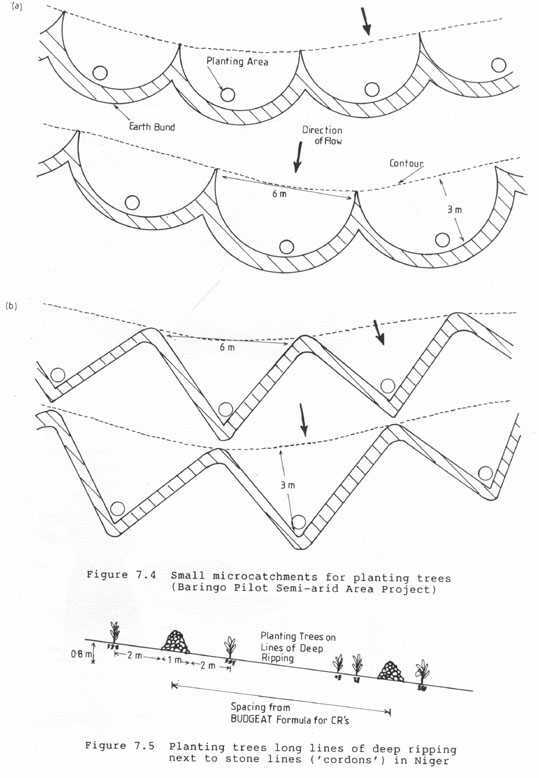 The cost of preparing and maintaining microcatchments means that it will only be economic for high-yielding crops such as fruit or nuts, unless a simple low-cost method can be used as in the Kenya example (Boers 1983). The imprinting method mentioned in Section 7.1.2 for establishing grass is also used for establishing seedlings (Anderson 1986). The same principle can be used by planting trees or shrubs in lines where increased water is retained by some type of contour furrow. In Tunisia this has been practised using very simple stone cordons, which are triangular loose piles of stones made on the contour and just downhill from where lines have been drawn with a deep ripper and a heavy-duty tractor. 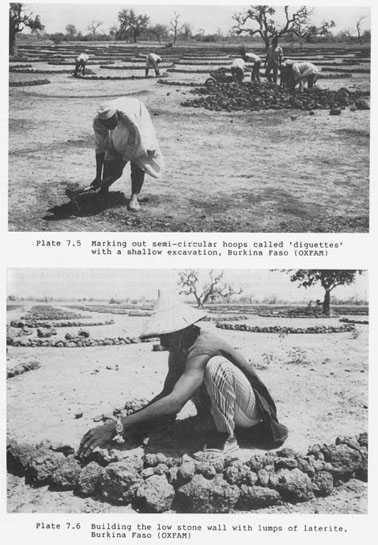 The combination of loosening the surface and breaking through a calcareous pan improves the infiltration and the water is ponded behind the cordon as shown in Figure 7.5 (Viertmann 1984). For the establishment of shelter belts in Iran, terraces were built on the contour, 2 m wide and at a 5 m interval on 30 degree slopes. The survival rate of seedlings was substantially increased, particularly if the catchment area was sprayed with asphalt (Kowsar 1982). In recent years, and particularly since the establishment of the International Council for Research in Agroforestry (ICRAF), there has been a strong surge of interest in farming systems which combine trees and annual crops (agroforestry) or trees and grass (silvipasture). Some practices are long established. For example, in many traditional agricultural systems in the semi-arid parts of northern Africa, some naturally occurring species are propagated by planting in shallow depressions where water naturally accumulates, for example Acacia albida, which is grown in association with cereal crops because of its remarkable nitrogen-fixing ability, or Acacia senegal, grown in mixed farming systems for the production of gum arabic (Houerou 1980). 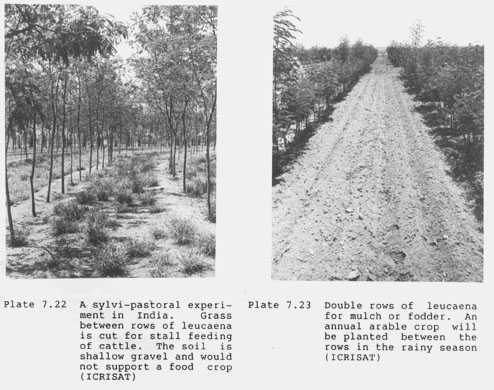 Other practices are new and being developed at the international research centres, for example systems which use Leucaena in rows with grass between (Plate 7.22) or arable crops (Plate 7.23). Some sources of further information on agroforestry are listed with the general references for this Chapter.